Thanks to Sean Captain at Switch.com, one of the leading gadget and tech websites for including ScanMyPhotos.com as one of the 14 recommended gadgets to give to Mom. The Editor's Pick and also the Most Popular article right now at Switch is the one mentioning ScanMyPhotos.com. We're cheering too! "9) ScanMyPhotos OK, so maybe you're a good nerdy child, you're getting mom all electronic with a digital camera, digital picture frame, camcorder and heck maybe even a Facebook page. But mom has spent decades accumulating memories in analog form-such as the thousands of photos sitting in the basement of in yellowing, cracking picture frames. No matter how much you love mom, you're probably not going to take a week off to scan all her photos by hand. So hire someone. ScanMyPhotos.com makes it easy-offering 1,000 scans to 300-dpi JPEG images on DVD for a scant $64. You'll have to spend some time sorting the pictures by size and bundling them up for shipping. But once you do, your work is done. 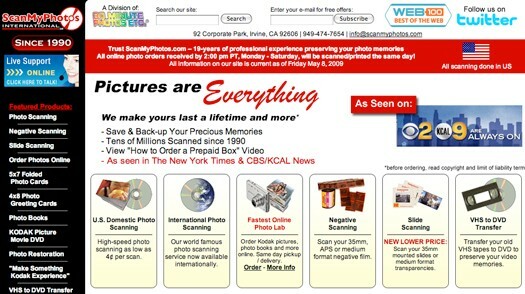 $64 for 1,000 scans; scanmyphotos.com"